More than a buzz phrase in human resources circles, “candidate experience” is an important part of the hiring cycle that everyone involved, from HR to hiring managers, should be aware of. Though there is no “official” definition, “candidate experience” can best be described as what a candidate experiences as they progress through the hiring process. This begins with their initial indication of interest in a position with your company and extends all the way through onboarding. 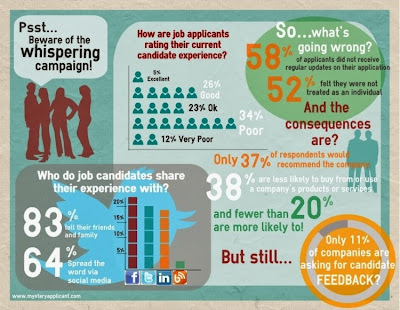 To get an idea of how important “candidate experience” is in not only recruiting top candidates but also in bolstering your company’s brand, take a look at the infographic below from MysteryApplicant.com. With 83% of applicants sharing their experience with family and friends, and 64% sharing it on social media, it is more important than ever to define what you want your company’s candidate experience to be like. Of course, every company would want a positive candidate experience, but what does that entail? After an interview with one of our clients, Candidate A expressed that he had “the best interview” because he felt like interviewer was “just talking to him.” The interviewer expressed interest in his military career, was able to make the correlation between the things he had done, and then made suggestions as to how this candidate would fit into the company. During a debrief after a Hiring Conference, Candidate B expressed his disappointment with a particular interview. He believed that the interview did not go well, and that the interviewer seemed disinterested. The candidate subsequently put this company down as a low interest to him, based on the interview, when in fact the company had up-screened him. If you are interested in the Veteran, keep the communication process moving smoothly, so he knows you are interested. The Veteran may be interviewing with other companies and if he feels he is not moving forward with your company, his interest may wane. Many Veterans express concern that they want the potential for growth and to be well utilized within the company. As an interviewer, focus on creating a comfortable environment and ask the right questions to best help Veterans sell themselves. This will impart great insight on their needs and where they may best fit within your organization. Communicate clearly and efficiently with the candidate throughout the hiring process, up through her first day on the job, which can lead to a larger range of future quality candidates through referral. If your company has not defined what type of candidate experience it wants to provide, you could very well be losing out on the qualified candidates who fall through the cracks, in addition to all those they tell about the negative process. The candidates you interview may very well be the employees that drive your company’s bottom line; why not invest in their experience and ensure you get the cream of the crop?